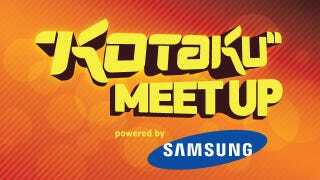 Kotaku is partnering with the wonderful folks at Samsung to hold a Meetup at next week's BlizzCon in Anaheim, CA. Will you be there? If so, come hang with the editors and fellow readers. RSVP to meetup@kotaku.com to get yourself on the guest list for Heat Ultra Lounge, where we shall eat, drink from an open bar, and experience the brand-new Samsung 950 Series 3D LED Monitors. The Meetup will be held on Friday, October 21 from 8-11. See you there!